This graph depicts the average MLB ticket prize of all Major League Baseball teams in 2018. The average MLB ticket price for a Houston Astros home game is 40.25 U.S. dollars. During the 2016 MLB season, the league-wide average ticket price stood at 31 U.S. dollars. This marks an increase of approximately 8 U.S. dollars from the price in the 2006 season. The most expensive ticket on average in the league cost nearly 55 U.S. dollars during this season, sold by the Boston Red Sox. 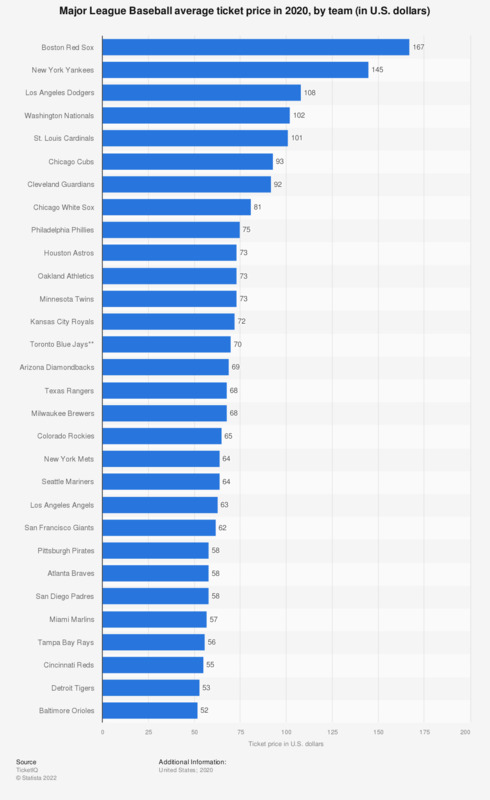 The New York Yankees and the Chicago Cubs are slightly behind at roughly 51 U.S. dollars, almost three times as much as the most affordable ticket in the league sold by the Arizona Diamondbacks. Ticketing revenue makes up a considerable share of the total revenue for all MLB teams. The Boston Red Sox averaged 170 million U.S. dollar in gate receipts from 2009 to 2015. Annual ticket sale of the New York Yankees were inbetween 250 and 320 million U.S. dollars during this period. In 2015, New York Yankees announced its highest revenue of 516 million U.S. dollars, constituting 16 percent of the overall revenue in Major League Baseball. The Los Angeles Dodgers and the San Francisco Giants came in second and third on the MLB revenue table in 2015, with about 440 million U.S. dollars and almost 410 million U.S. dollars in revenue respectively. * Average ticket price represents a weighted average of season ticket prices for general seating categories. This is determined by factoring the full season ticket for each category as a percentage of the total number of seats in each venue. This takes into account variable pricing. Premium seating (tickets that come with at least one added amenity or is classified by team as premium) are not included in the survey to calculate average ticket price. Average Premium Ticket prices are listed separately. Luxury suites are also excluded. Season ticket pricing is used for any team that offers some or all tickets at lower prices for customers who buy season seats. When a seat category is not offered as a season ticket, we use the weighted average. ** Prices for Toronto tickets are converted to US Dollars using Bank of Canada monthly average exchange rates for the first three months of each year. What was the price of the air ticket (round trip) per person?